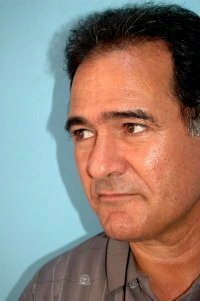 Omar al-Kikli is a prominent Libyan short story writer, from a generation of Libyan writer that suffered greatly under Gaddafi regime. He was one of a new generation of Libyan writers in the early in 1970’s that came onto the literary scene full of hope and new styles and ideas, only to be imprisoned for a decade, accused of plotting to topple the Gaddafi regime. These are a sample of a collection of short stories named (Sejneyat), written to commemorate two decades of his release from prison in 1988; they are a testament of the years he spent with fellow Libyan writers and intellectuals in different Gaddafi prisons. The stories follow the journey of a political prisoner from the first day of his imprisonment, during which he is adapting to this new reality, learning to survive in a place that is intended to crush you physically and mentally. Al-Kikli satirises the ordeal of imprisonment in simple direct style that does not shy from presenting the harsh realities of the prison, but never fails to leave a trace of a smile,alas painful one, whenever reading these tales. After I was pushed into the cell, the iron door slammed on my face and I felt as if its heavy echoing movement has crushed part of my soul. I tried to overcome my bewilderment and adapt myself to my new status and place. I examined the dark depressing walls that were squeezing the tight space, trying to find traces of those who occupied this place before me. There were some traces and writings carved or written with different ways and materials on the walls. A name and a date, was usually, written at the end of the carvings. I felt an enormous dread. And said to myself, can that be possible?! Is it possible for a human being to live in this place all this period! Impossible! I can't do this; if I don't die I will kill myself. I stripped off two complete years in that cell. There was a prison guard who used to give food to us and take the sick prisoner to the jail doctor whenever he is not busy with his torturing duties. It was astonishing how some of his victims remembered him with gratitude and reverence! The reason for that they said, was because he used to perform the torture with a technocratic conscience!As he performed his job without inflicting any kind of sentimental harm to the victim (the raw material of his job, from his point of view), however performing his job, with sincerity and dedication and in silence, until the material is pliable and ripe, and is ready to be handed over to another authority to enter the next stage of the process.